Chocolate and banana happens to be one of my all-time favorite flavor combinations. On ice cream, in muffins or breakfast breads—it’s all good! One place I hadn’t tried this combo was in a cookie though. I started out wanting just a banana chocolate chip cookie, but thought the texture might be a bit off. It turns out that some hearty oats is just what this idea needed to come to life. The cookies below are nice and chewy with bits of chocolate and rolled oats throughout. The banana adds a subtle sweetness and familiar flavor that I bet you’ll love. Enjoy! 1. In a large bowl or in a stand mixer, cream together the butter, sugar and brown sugar. Mix for 2 to 3 minutes until fluffy. Add in the egg and mix to combine. Mix in the mashed banana and vanilla extract; set aside. 2. In a medium bowl, combine the flour, baking soda, salt and cinnamon. Add dry ingredients to the wet in two batches, mixing until completely combined each time. 3. Fold in the oats and chocolate chips until well combined. Chill dough for 30 minutes. 4. Preheat oven to 350°F. Spoon dough onto a parchment paper-lined baking sheet in 1 1/2 teaspoonful scoops. Space cookies at least 2.5-inches apart. Bake for 9 to 11 minutes or until almost set in the middle. Remove from oven and let cool on baking sheet for 1 to 2 minutes, then carefully transfer to a wire rack to cool completely. Store in an airtight container. SWWU Tip 1: Bananas going bad? When they start to turn, stash them in your freezer. We always have a few on hand. To defrost, just move to the fridge the day before you want to use them. 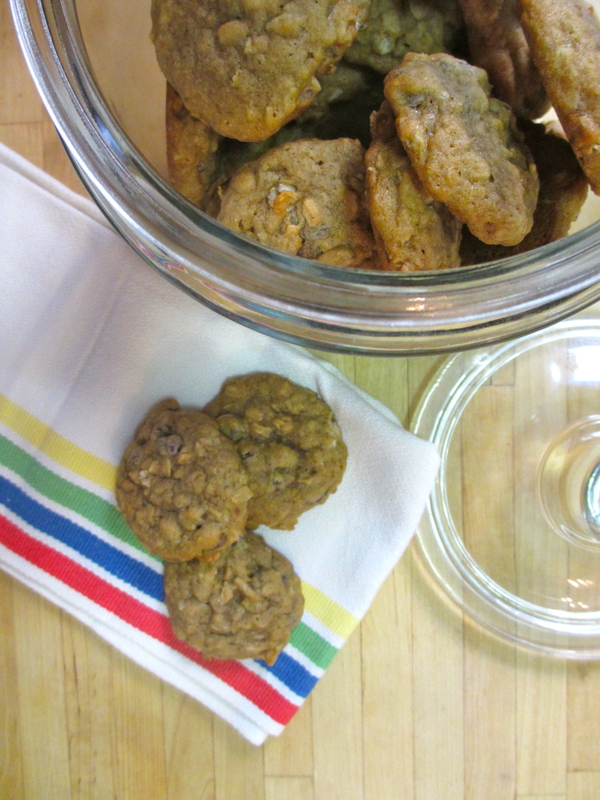 They’re great for smoothies, banana bread, and of course, these cookies. SWWU Tip 2: Try adding half a cup of walnut or almond pieces to this recipe. A bit of crunch could be a nice addition. (Someone in this house is allergic to nuts, so I wasn’t able to try this tip out though, I’m sure it’s delightful!). SWWU Tip 3: Sandwich two of these around a scoop of ice cream (chocolate, vanilla, cinnamon—whatever you like) for a special treat. This entry was posted in In the Kitchen and tagged @SWWUblog, banana bread, banana cookies, Banana-Oatmeal Chocolate Chip Cookies, cookies, dessert, guilty pleasures, homemade vanilla extract, ice cream sandwich, in the kitchen, recipe, rolled oats by Something We Whipped Up. Bookmark the permalink.